Matrix Team Works and Annapura Studio’s joint venture ‘Nirmala Convent’ introducing Mighty Star Srikanth’s son Roshan as hero and Shriya Sharma as heroine got its first digital trailer released a while ago. With Nag’s active involvement into making of this flick, there’s a fresh feel added on to this refreshing romance between two really cute youngsters. 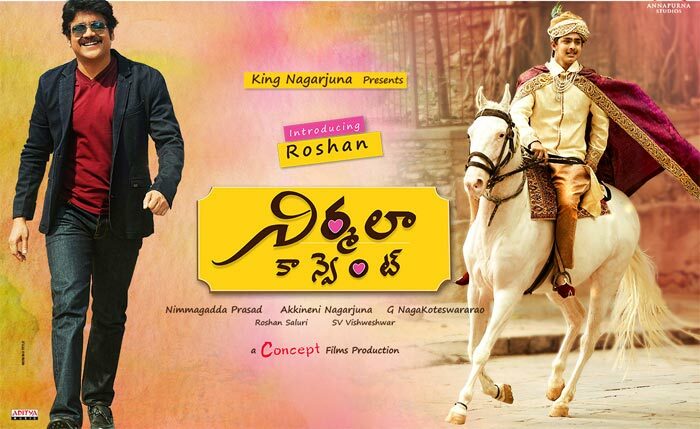 Although, story seems to be a popular template of boy and girl falling in love in an educational institution backdrop, what mattered more are the high production standards and pleasant treatment from director Naga Koteswara Rao with senior music director Koti’s son Roshan Saluri composing a soothing music. ‘Nirmala Convent’ trailer hinted on the central plot of Samuel (Roshan) winning his lady love Shruti (Shriya Sharma) after facing a challenge from Nagarjuna and also clearing the main obstacle of differences in family statuses. Roshan portrayed minute expressions so sweetly and his screen presence is appealing. Shriya Sharma is also a delight for eyes. Let us wait for ‘Nirmala Convent’ official release date because this trailer made the film worth a wait. Kabali In Fox Star Studio Hands!